Please contact me first, I'm a cash buyer looking for a 991 C2s or 4s. Been looking since August and bought a lovely C4s before Christmas but the PDK box blew when they were delivering up to me a couple of weeks ago (car only covered 14k miles!) so refund of deposit and the hunt continues. Sorry to jump on your bandwagon Gilford. I don't think I'm treading on your toes as your budget must be bigger than mine. I'd be interested in hearing from anyone looking to beat their part-ex quote if they've got an early 991 2S to sell. Must be PDK and in grey, red or blue. looks like a sellers market with these 2, 991 owners. Market has been stale for months, same cars stood for months at what I can only think at inflated prices. Phoned about a standard 15 plate C4 today @ £72k, it Books at @ £54k! Do people actually want to sell??? 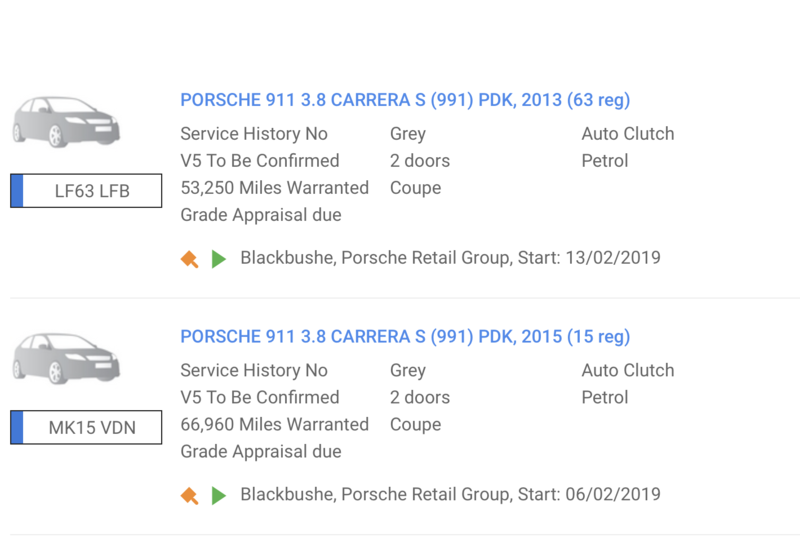 A couple pop through BCA every week, mainly cars coming back on Porsche finance or PX. Thanks but I’m looking for a low mileage car, will be used as a daily for the next 12-18 months at least I’d imagine. I'm assuming that you're saying that £54k to £72k shows the spread between 'bottom trade' and 'top retail'. I don’t really have a set budget, happy to pay for the right vehicle, but yes circa £63k for a private sale would make sense and the seller would be on a win win.